Korea National University of Arts (한국예술종합학교) Art Major Asian Scholarship for 2020 application is now open! The scholarship invites talented Asian artists acquire undergraduate and graduate degrees providing full tuition and monthly stipend funded by Ministry of Culture of Korea. 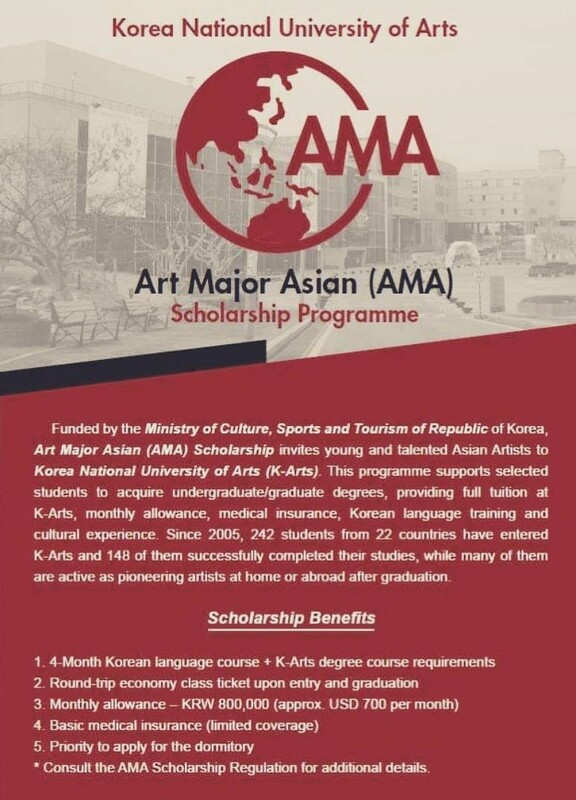 Art Major Asian (AMA) scholarship is a global initiative of the K-Arts as a part of Korean government’s ODA projects. Qualified students are encouraged to apply for the program-check eligibility on our website and application guideline. The objective of the Art Major Asian(AMA)* Scholarship Program is to support students with artistic talent to conduct advanced studies and ability in Korea National University of Arts in order to promote international exchanges in education and mutual growth between the countries. Personal Medical Assessment * participants are requested to be physically healthy to follow the AMA curriculum at K-Arts. NO ONLINE SUBMISSION. The application documents can be sent by either by post or in person. Late and incomplete submission will not be accepted. All submitted documents will not be returned. Upon review of application packages submitted, passing candidates will be individually notified for follow-up interview or official invitation. Will begin 2020 AMA program on 1st November, 2019. Arrival dates are negotiable when impossible to arrive in Korea before 31st October 2019.